Discussion in 'General' started by bdm7250, Feb 3, 2019. Minuteman, Nukeranger, fiftyonefifty5150 and 5 others like this. Sweet baby Jesus! That is amazing!!! Looking good Douggy! I was really starting to wonder if you'd ever get them definitely worth the wait! bdm7250, PacoPetty and Big D Florida like this. Great work!! And Ed does his magic yet again!! bdm7250 and airbrush-ed like this. bdm7250 and PacoPetty like this. Unbelievable, was wondering when you were gonna post these. Guess you wanted to wait till you mounted them! Arguably the most unique paint job on any BigDog. I know the detail is impeccable as well and hard to notice on the pics but you can see it in the close ups you did of the skulls. Nukeranger, bigkelk9, bdm7250 and 2 others like this. Mind boggling. There was nothing in this league at the EZ Rider bike show I just attended 2 weeks ago. This is by far the best paint job I've seen.......wish I could see it in the flesh. 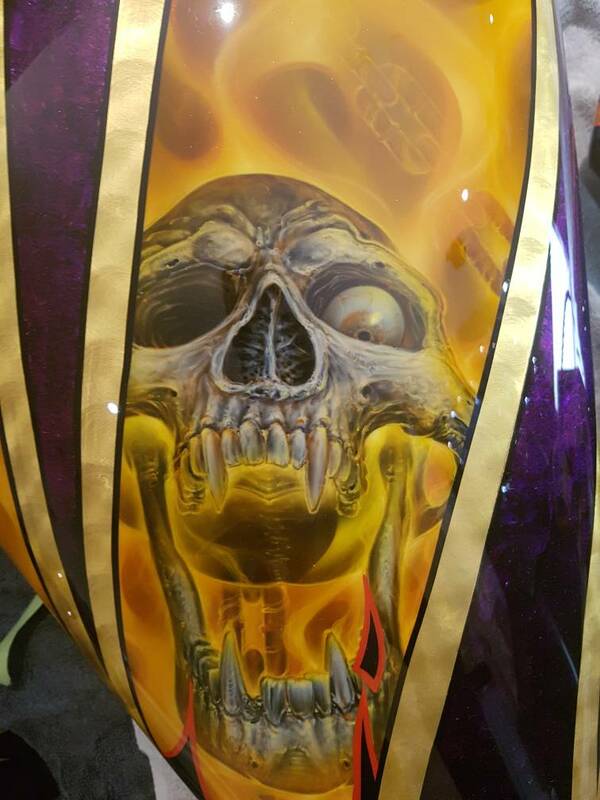 I thought it was just realistic flames, and then I saw the stripes.......and then I saw the skulls.......and then I saw the gold leaf......the layers took a lot of time to absorb. I'm totally blown away. Who did the work ? Do you mind sharing what it cost.........or at least hints ? Truly stunning. Thanks for sharing. I guess the snowy part of the year makes the good parts that much better. Settle down Brent! Go rub one out and come back to the forum when you are less emotional! Big D Florida, TapioK, bigkelk9 and 2 others like this. What kind of seat are you gonna put on it now? the "Ed" Doug is talking about is forum member "Airbrush-ed". he was the painter for the original Big Dog Motorcycles that did the Level 7 and above custom, one-of-a-kind paint jobs with the ideas left up to his own imagination. if i'm not mistaken, he is doing the paint for the new BDM, as well. It does need a seat. See my posts on the topic. Emotional ? Maybe......I like my paint, but have been thinking about changing the tank and repainting. Tribal is a trademark of the era these bikes came from, but I have yet to find something to replace it. I went to the EZ Rider show to find inspiration but nothing leapt out to me as breaking new ground. PacoPetty and bdm7250 like this. Yes, he paints for Big Dog full time and works long hours which is why he really no longer has the time for custom jobs. Poor guy works his tail off. But Ed Williamson is the very best out there IMHO. No one can touch his depth. Nukeranger, bigkelk9, Trainguy and 2 others like this. When him and I were talking this summer, he said Doug's was probably his last for the forceable future for a one off paint job because he just doesn't have the time he needs to dedicate to get it out. He labors over the paint for a long time. I bet Doug's paint is probably 100+ hours of labor. PacoPetty, Biker Babe and bdm7250 like this. It was an emotional rollercoaster, but I really love the work that Ed did, his talent astounds me. I have thanked him personally but would also like to put a big thanks out here for everyone to see... long journey but I feel it was well worth it. PacoPetty and TapioK like this. C'mon Andy emotion is a good thing.. Outstanding to say the very least.